Doesn't work on supported controllers? I just found HDSentinel and are considering deploying it to all our servers if possible, but it doesn't find disks even tough the controllers are supported? Re: Doesn't work on supported controllers? 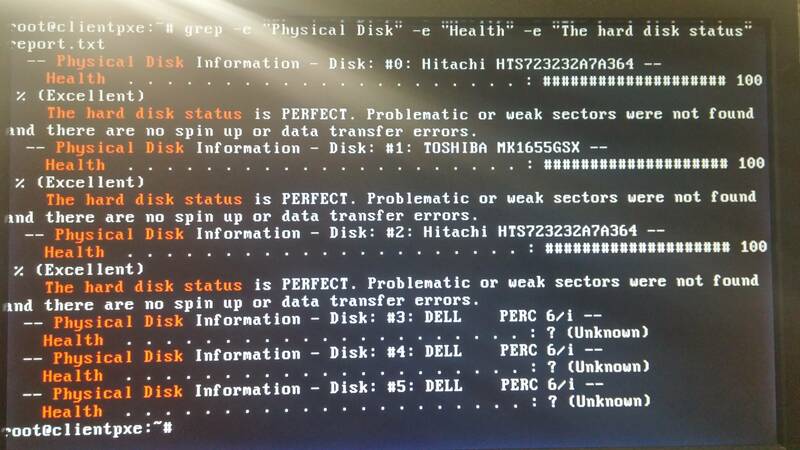 "The following list contains the list of hard disk controllers tested and compatible with the Windows version of Hard Disk Sentinel. Under DOS or Linux some hard disk controllers may provide more or less information." Under Linux things are different - so it is possible that only partial information displayed, depending on the differences of the OS and drivers for the actual controller. The Linux version is being updated (the current latest is a bit old) - the updated version may be able to provide further hard disk information with this controller. Would be great with a updated version - any ETA? I can't promise actual date (I do not like that - as something can always happen) but will try the best. I can make sure that the released version will be published on www.hdsentinel.com website, facebook, twitter etc.. as soon as possible. Personally I thought it may be better to support development by buying something which you can give to your family members, friends, colleagues - or just keep them as "it can be useful one day" (for example if you order a Hard Disk Sentinel Pro license which can be used with the Portable version from a pendrive) when you ever require on a Windows system. I'm bumping this question up. Will the linux version be updated for raid controllers any time in the future ? Also Is there a comparison of what the linux version can do compared to the windows one ? Without knowing the actual situation, it is hard to say anything for sure. Generally yes, the Linux version is also improving and support for controllers added - just this is (much...) slower than the Windows version. Please at least mention the Hard Disk Sentinel Linux version you tried, the Linux distro you used, the RAID controller you tried, disk types and so. The best is always is to save a report with -r switch and send in email to info@hdsentinel.com and then it is possible to check the actual situation. No, I'm afraid there is no comparison available, it is impossible to make due to the extremely high number of combinations of Linux distros, RAID controllers and drivers used by the Linux for these. Many times the drivers limit our possibilities (regardless of OS). I mean if the detection is possible under Windows by the Windows version of Hard Disk Sentinel, it may not mean that things are working under Linux too - as the Linux driver may miss some functions/features and generally work completely differently. This is exactly why the Linux version is available for testing - and if things do not work well, the report always help to check the results and verify the possibilities. In the latest Hard Disk Sentinel Linux version, many RAID controllers added and supported with LSI chipset, including LSI / Dell / IBM / Intel RAID controllers, so the detection may work properly with these - but this depends on the Linux kernel / distro too. I'm sorry I messed up my question, after more playing around I figured out that it might be the disks used that have a problem. I used the current version of HDSentinel available on the site, I cannot say what disk exactly but they are all SAS disks. The server I used to test it was a Dell PER710 with ubuntu 16.04. HDSentinel was able to give all information about any SATA drive I added to the server. That's how I figured it's the disk and not the raid controller. None of the SAS disk have any information on them but the SATA have all the information I need. Disk 0 to 2 are SATA, 3 to 5 are ISCI. Thanks for the information, the image and the details ! Yes, I forgot to mention that on Linux, only the SATA hard disks can be detected if connected to these controllers. Under Windows (due to completely different OS, driver and access methods we can use) it is possible to access the status of both SATA and SAS drives too (even if configured as RAID) but under Linux, we have only status of SATA hard disks, as you can see. Maybe if you have the opportunity, I'd recommend to try a bootable live Windows pendrive/DVD, boot the system from that and start Hard Disk Sentinel Pro Portable under that. This way the Windows version may be able to detect the currently missing details and show the complete status of the SCSI (SAS) drives too in addition to the SATA disks. Team, I noticed this respond is for a year ago. is there any update or news about SAS HDD on Linux version? I can view SATA and SSD disk behind Hardware Raid, but only SAS cant view. Highly appreciate if you can do something about it. i love your app. its awesome and very helpful. No, I'm afraid (as this is limitation of the Linux driver) under Linux SAS drives can't be detected on this DELL PERC controller. Noted and appreciate your update on this. and thanks again for such handy application.